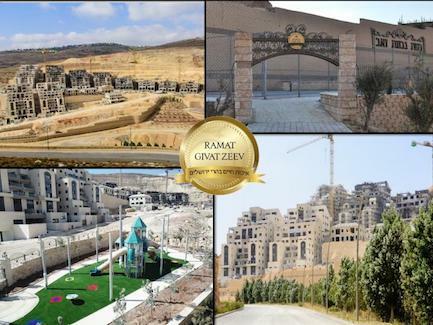 Ramat Giv’at Ze’ev: The highly anticipated planned Jerusalem suburb of Giv’at Ze’ev is being specifically built to meet the preening sense of entitlement very high standards of Israel’s Anglo Community, specifically those from North America. The development will have such Anglo-friendly amenities as large master bedrooms, closets (Note to our native Israeli readers: a closet is like a very small room where you can store things! ), private parking, dishwashers, big kitchens, and a country club. Yet that’s not all. In order to truly capture the flavor of the typical North American Jewish community, the development will have two Shuls: one Shul that you go to and one Shul that you wouldn’t enter if they were giving out free salmon by the pound. The Daily Freier spoke with lead architect Danny C. to get all the details. The shul is too big. It’s like you’re in a mall or something. The shul is tiny. It feels like you’re praying in a closet. The building feels dated, like something from the 1970’s. The building looks like a spaceship. It doesn’t even look like a Shul. 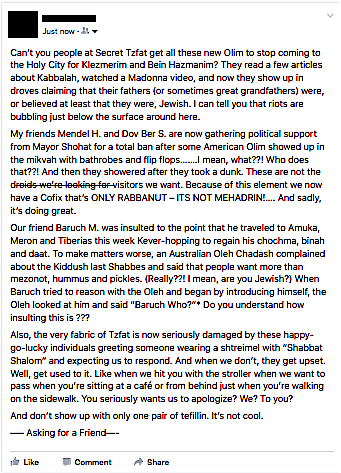 The Rabbi won’t stop talking. The Rabbi is a right-wing fascist. The Rabbi is a left-wing idiot. The cantor is quiet as a mouse. The cantor is a giant showboat. The women’s section is a bunch of gossips. The women’s section feels like a morgue. What is this a race? The mincha was over in 5 minutes. My ex in-laws go there. The kiddush doesn’t have enough food. Did you see the portions at the kiddush? Can you believe they called that a kiddush? Don’t get me started on the kiddush. While prices for the development’s homes vary based on size and location, Danny assured us that your friends will say that you paid way too much.